The Alfa Romeo Alfetta coupe was a front engine rear-transaxle equipped fastback built in Milan from 1972-1987. The Alfetta replaced the successful and gorgeous GTV, big shoes to fill for the Giorgetto Giugiaro designed coupe. The Alfetta will never be as collectible and cool as its Giulietta predecessor, but today's values are depressed and the time for picking one up couldn't be better. 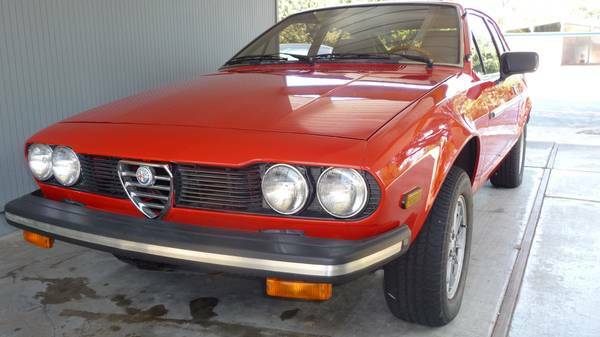 Find this 1979 Alfa Romeo Alfetta GT (Sprint Veloce) for sale in Sunnyvale, CA for $6,000 via craiglist. Tip from Nicolas B. This Alfetta is covered in a nice shade of red paint and looks great for the asking price. The 2.0 liter inline-4 cylinder DOHC engine puts 150 horsepower into the rear-mounted 5-spd transaxle. Weight distribution is rumored to be a perfect 50:50 front:rear and the Alfetta is supposed to be a great car when running properly. Sure you could get a basket case Alfetta for a few hundred bucks, but you'd easily put $5k into the pile getting it up to driver condition, so why not buy this clean example and save your time/effort and money! I owned about 8 of these cars back in the 80s and they were absolutly great! Biggest problem was rust and yes it took some time to heat the oil in the engine up, but what a great car. Still love this model and yes I still own one. Driving Alfa Romeo's like this becomes an addiction. Once you have driven one you always want to drive these cars. I still miss the time that Alfa's beat every other car in their class. At the moment, I am 53 now I own a Alfa 166 and yes an old Alfetta GT 2.0. still love the sound of the engine and working on it. I own Alfa's for 35 years now and still love them. BTW... please mention me any country where they can make cars as beautiful as in Italy... Impossible! !